It used to be that childbirth classes were mandatory in some hospitals if you wanted someone to come into labor and delivery with you. You’d have to show up with a certificate of attendance, signed by your teacher. Attendance at childbirth classes is not mandatory anymore. Though the benefits of childbirth class can be great for women and their partners. So important, in fact, that Healthy People 2020 has a goal of increasing attendance at childbirth classes. When you talk to people about why they didn’t go to childbirth class, it tends to fall into one of these myth categories. 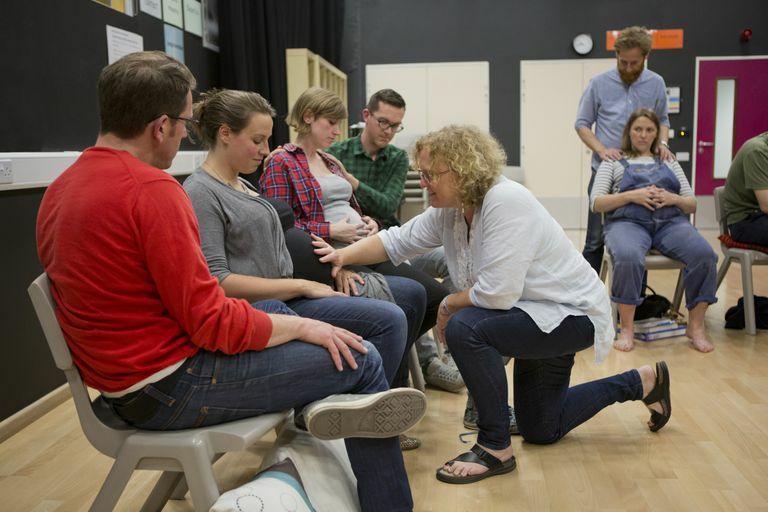 Childbirth class is a time commitment, just how much time will vary. Most certifying organizations for childbirth educators have at least a 12-hour requirement, some classes are as high as 24 hours. Yes, that’s right. When you look at the weeks of childbirth class broken down, even the longest is only one day. Even if you have an odd schedule, there are many childbirth educators who will teach private classes for you and your partner at convenient times. While you will have nurses that will be caring for you during your birth, they have many medical tasks to take care of and potentially more than one patient. This doesn’t leave much time for teaching. Not to mention that by the time you are there you’ll be in labor and not super receptive to learning. Oh, and you weren’t able to practice or use techniques that you learned in early labor. Just because you want an epidural, doesn’t negate the things that you will learn in childbirth class. You will learn how to tell when labor has started, what the process of getting an epidural entails, how to cope with labor (which is useful in early labor, prior to the epidural), postpartum comfort measures, breastfeeding, baby care, and more. Sometimes it’s just nice being with other couples who are experiencing the same thing. Many of the childbirth classes today are a mix of couples who want medication in labor, undecided, and those who wish to avoid medication. You can still take a childbirth class and get an epidural. Most childbirth educators teach empowering childbirth classes. How to get information and process it in a way that helps you make the decisions that are right for your family. There is not a judgment process in class. A childbirth educator is paid once when you sign up for the class. Her earnings are not dependent on what type of birth you have with your baby. Childbirth classes, like the services of all the others who help you when you have a baby, do cost money. Though many childbirth educators have payment plans or even some scholarship spots in their classes. You can also talk to your insurance company about insurance coverage of childbirth classes. While there are some free or low-cost classes, these do not always have the same high standards as other classes. Ask about the childbirth educator’s certification background and current status, ask how many couples in the class (fewer than 10 is the goal), ask how long the class runs time-wise, ask if the childbirth educator is employed by a hospital or practitioner’s office and other pertinent questions. It is also worth noting that childbirth classes should be spaced out for better retention. This isn’t to say that there is no place for a crash course, but many crash courses, particularly those in large group settings or taught by hospitals are not childbirth classes in the true sense of the word, but more like glorified hospital tours, which also have their place for learning about hospital policies. You can also take childbirth classes online. While it is true that some partners are reluctant to come to childbirth class, a good childbirth educator is prepared for this possibility. Helping partners feel more comfortable is a part of their job description. They will teach certain things specifically for the partners to use in labor to help you and show them how to participate in the birth as much as they wish without feeling uncomfortable. Maternal, Infant, Child Health. Healthy People 2020.